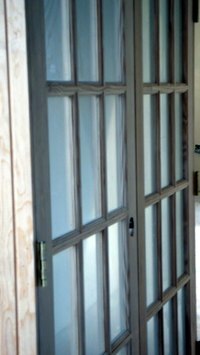 When it comes to choosing patio doors, many homeowners choose the Pella brand because of the company's reputation and the various door options that it offers. From time to time, however, Pella doors may have problems that inconvenience homeowners. If you have Pella doors in your home, familiarizing yourself with some of most common issues may help you resolve the problem more quickly when one occurs. In some instances, you may notice that the Pella door’s frame is not level or is slightly out of square. As a result, the door may not be able to close properly, allowing air to enter between the frame and the door panel. To address the issue, the frame’s hinge leaf screws should be loosened and plastic shims should be added or removed as necessary to square the door frame. Remember to tighten the hinge leaf screws afterward. Some Pella doors, however, have adjustable hinge leafs, so plastic shims are not necessary. An Allen wrench can be used to turn the hinge’s center screw in a clockwise direction so the space between the lock side of the frame and the door panel increases and the frame is squared properly. If you notice a draft in the vicinity of Pella doors, there may be an issue with the way that the doors fit against the weatherstrip. If the doors do not fit tightly against the weatherstrip, unwanted air can enter. Many styles of Pella doors have an adjustable striker shim that can be used to create a tighter seal between the door and the weatherstrip. Begin by removing the strike and adjustable shim. Adjust the shim by removing its tabs and replacing it in the frame with the thicker side facing the strike edge. Reset the strike so the door closes tightly against the weatherstrip, preventing air from infiltrating. On some occasions, you may notice resistance when you try to open or close the Pella sliding doors. Typically, this is the result of dirt or debris inside the sill track. Clean the track with a vacuum, broom or small brush. If the door is still difficult to open and close after cleaning, a dry silicone spray or other lubricating product may be used so the doors slide through the track more easily. A Pella flat screen sliding door may not latch properly if the door is misaligned with the frame’s strike, leaving you unable to lock your door. To align the door and strike correctly, use a screwdriver to loosen the screw in the center of the strike. Move the strike up or down as necessary to align it with the door. After achieving the correct alignment, replace and tighten the screw. What Is the Size of a Pella Window Rough Opening?